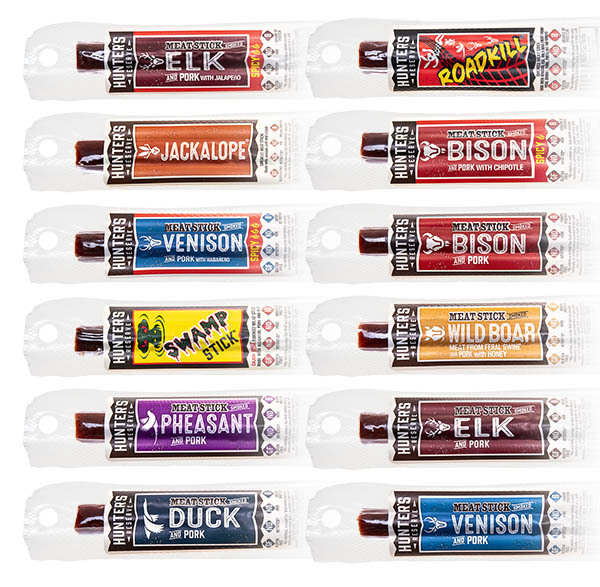 Wild Game Meat Sticks: A variety pack of exotic animals. Treat your taste buds to a carnivorous safari and bite into Wild Game Meat Sticks. Each of the dozen meat sticks contains a blend of wild game, pork, and spices (and occasional heat provided by piquant peppers) to create a unique taste you're sure to want to snap into. Alongside irreverent flavors like jackalope, roadkill, and swamp stick, you'll find classics like elk and bison and even poultry such as duck and pheasant. The collection of cured meats represents an entire zoo for your belly. Mmmmm! Meat! 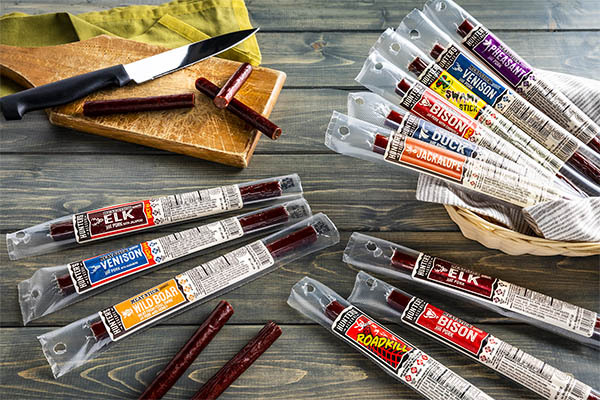 Up your snacking game with Wild Game Meat Sticks, a selection of sausages made with exotic animals. The menagerie of meat includes unique flavors like pheasant, rabbit, and alligator with delicious game mainstays like venison and elk. Snap into something a bit more special than gas station fare and hunt for your favorite flavor in this 12-pack! 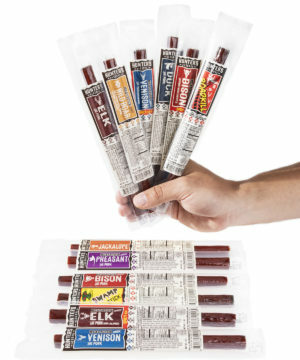 This selection of meat sticks includes twelve different flavors that pair unique animal meats with delicious spices: spicy venison (and pork with habanero), spicy elk (and pork with jalapeño), spicy bison (and pork with chipotle), bison (and pork), venison (and pork), elk (and pork), wild boar (meat from feral swine and pork with honey), duck (and pork), swamp stick (cajun-style alligator with pork and beef), jackalope (venison, pork, and rabbit), pheasant (and pork), roadkill (venison, elk, wild boar, pork, pheasant, and rabbit). One thing that all of the delicious flavors have in common is that they're gluten-free, nitrite-free, and MSG-free. 12 bold flavors per box! Question: Roadkill? Is this a challenge food or real food? Answer: Some of the sausages have clever names, but they're all delicious meats meant to be enjoyed! Question: Is the jackalope real? Answer: A jackalope is a mythical cross between a deer and a rabbit. Since jackalope sausage contains the meat of both animals, the namesake is a fittingly clever and delicious tribute.